Curry doesn’t have to be so hot that it makes you reach for the jug of water and this mild Aubergine Masala has just enough spice to notice it, but not so much to ruin it. It’s rich and creamy, veggie packed aubergine curry and all made in the Crock Pot (Slow Cooker) to save you time and effort. Aubergine and I have a bit of a strange relationship, as I don’t love it in all things, so I wouldn’t say that I was its biggest fan. But, there are two things that I adore it in and that’s babaganoush (duh!) and curry. It’s a great vegetarian way to bulk out a curry and add a ton of flavour, which is why this aubergine Masala was a big hit with us. We are trying to cut down to just 2 meat meals a week for health and environmental reasons, so that means we are discovering some incredible new vegetarian and vegan meals that don’t miss the meat. Aubergine has such a meaty texture, that it’s always a favourite in vegetarian meals. You guys know how much of a fan I am of slow cooking (I have a slow cooker book that is on sale now), but I haven’t talked much about slow cookers themselves. 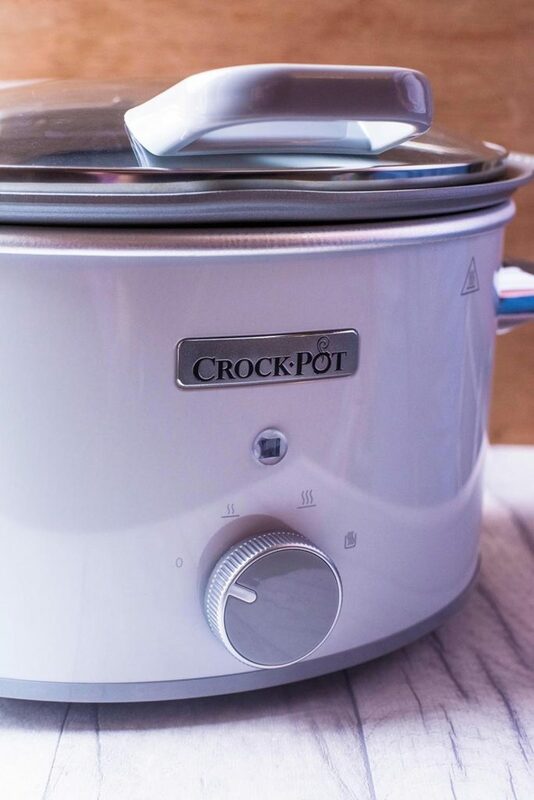 When Crock-Pot challenged us to take part in Crocktober (oh how we love a pun) and slow down by swapping one regular meal a week for the month of October with a slow cooked meal using a Crock-Pot, we jumped at the chance. Who doesn’t want to use their slow cooker more? The brilliant thing about a slow cooker is that you throw all the ingredients in, leave it for a couple of hours and then when you come back you’ll have a delicious meal waiting for you – leaving you free to do something else instead in the cooking time, like head to the gym or spend time with friends and family. We actually went a step beyond the challenge and have had 3 slow cooker meals this week, so it has freed up loads of time for us to go out and explore our new area. We have been on long walks, played on the swings and enjoyed plenty of coffee and cake family dates. Couldn’t have done all that if we had spent loads of time cooking. The Crock-Pot really is a must for busy families – Make it Fast, Cook it Slow. What saved us even more time was that we didn’t have to come up with the recipes ourselves, as they were created by Great British Menu chef, Neil Rankin and they were all delicious. We chose to share this Aubergine Masala recipe with you first, and we have one for the meat eaters at the end of the month, so look out for that. Slow cooking is so much more than just stews and casseroles, and Neil’s recipes have really highlighted that. The possibilities are endless when it comes to slow cookers and you can use your Crock-Pot to make restaurant-ready delights such as Pork Belly and Mexican enchiladas. What can I cook in a slow cooker? Why not try Asian-style lamb? Or Malaysian curry? Or desserts such as Chocolate lava pudding or crème brûlée. So much you can do! Crock-Pot is the original slow cooker. Launched in North America in 1971, Crock-Pot has been trusted with meal times ever since. For over 40 years Crock-Pot has led the way in electrical one-pot cooking as more and more people across the world embrace slow cooking as the convenient way to create hearty, flavoursome family meals. It’s one pot, but with endless possibilities. We used the Crock-Pot 4.5L DuraCeramic Sauté Slow Cooker and it represents a step-change for the industry, introducing a multi-purpose aluminium pot that can be used on all hob types, and finished with a revolutionary DuraCeramic coating that is free of PFOA and PTFE non-stick chemicals, giving it four times the durability of standard products. Being able to use it on the hob first is amazing, as it really is all done in one pan. Now, this isn’t the lowest calorie curry as it uses butter and cream, but sometimes you just need the real deal and once in a while there is nothing wrong with that. This is also so much healthier than ordering takeaway, where you would have over double the butter and cream in it. Remember, it’s what you do most of the time that matters, not what you do once in a while. Can This Aubergine Curry Be Made Vegan? Aubergines are a great ingredient for a vegan curry, as they are naturally quite meaty in texture. To make this vegan, swap out the cream and butter and use a little coconut milk instead. This curry freezes really well and is great for batch cooking. You might need to add a little stock or extra cream when reheated as it might be too thick. One: Set your slow cooker to high for 2-3 hour cooking time or slow for 4-6 hours. Two: Remove the inner pot of the crockpot and put on the hob (if your crock pot allows for this – if not follow tips in notes). Add the oil and gently fry the onions. Add the spices and fry for 3 minutes and then add the aubergine and tomatoes. Three: Add the rest of the ingredients (apart from the cream and butter) to the slow cooker and put the insert back in to the crock pot and cook on high for 2-3 hours. Four: Stir in the cream and butter and serve with rice. You could make this curry with courgette (zucchini) instead of aubergine if you aren’t a fan. Make this lower in calories by swapping the cream for some 0% Greek yoghurt. You can serve this with rice, or a naan bread. This freezes really well, so make a big batch and freeze for quick and easy meals. If your slow cooker doesn’t allow the insert to be put directly on the hob, follow those sets using a frying pan and thn just transfer everything in to the slow cooker. Do you want to be kept up to date on more delicious posts like this Aubergine Masala? Please subscribe to the blog mailing list (it takes 30 seconds). 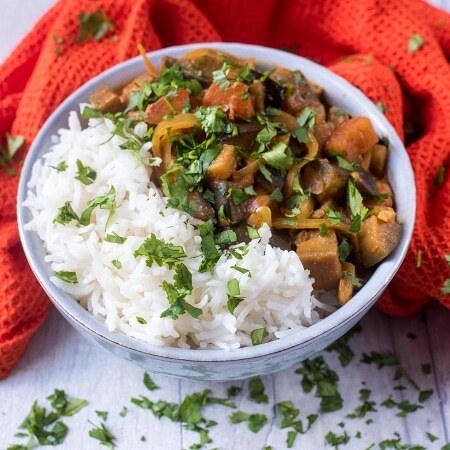 If you’ve tried this curry, or any other recipe on the blog, then let us know how you got on in the comments below, we love hearing from you! You can also FOLLOW US on FACEBOOK, TWITTER, INSTAGRAM and PINTEREST to see more delicious recipe ideas, behind the scenes shots and also what we are getting up to. Curry doesn't have to be so hot you can't taste it. This mild Aubergine Masala has just enough spice to notice, but not so much to ruin it. Remove the inner aluminium pot of the Crock-Pot and place on the hob. Add the onions and fry in a little oil. Add the spices and fry for 3 mins then add the aubergine and all the tomatoes. When they are hot transfer to the Crock-Pot add the rest of the ingredients apart from the cream and butter. Cook down until the oil begins to separate and finish with the butter and cream and salt to taste. (If liked, you can puree about half the mixture and mix together). Serve with some basmati rice and your condiments of choice. You could make this curry with courgette (zucchini) instead of aubergine if you aren't a fan. If your slow cooker doesn't allow the insert to be put directly on the hob, follow those sets using a frying pan and thn just transfer everything in to the slow cooker. Love your aubergine masala you made it creamy with almond paste. Spices you added also perfect. Next time if you can find some tamarind juice try to add that tamarind and aubergine makes really good combination. This looks so delicious! I agree about curries being too hot sometimes. I love how you “unheated” this one. It sounds just right! I think it’s perfect for a winter night as a curry is always so welcoming in our house. I really love slow cookers as they make dinners super easy. I’ve never tried aubergine before though! I have become obsessed with aubergine since we started growing our own but I’ve not yet used them in a curry – I’ve grown out of the habit of cooking them because they take so long.I really need to start using my slow cooker again! This is definitely the recipe to kick my bum into gear – looks fab! Ooh looks so yummy, I’m a big aubergine fan. And I love that this Crock-Pot can go on the hob! Game changer! I never liked aubergine when I was younger but love it now, especially in a curry! Thanks for a recipe. I’m loving all the spices and flavors in this veggie bowl. Sounds delicious! I adore my Crockpots! I have 3 of all different sizes! I cook everything in them but haven’t tried a Masala yet! I will give yours a try! It looks so delicious! I love crock pot meals! I also love recipes with spice and flavor. This looks good. What a fantastic recipe! Packed with incredible flavor… I need to try this! We used to order a curry every Friday, but now we make our own. It’s one of the small changes we have made and I have lost 8lb in 3 months. I would love some more curry ideas though, as we tend to make the same thing. I never thought to try one in my crockpot though. Does this have any spice to it? I never know what to do with aubergine apart from Ratatouille, so thanks for the idea. It looks nice and easy in the slow cooker too. I love the sound of the curry. It looks delicious. I don’t like curry to be too spicy so this sounds perfect. We love buttery and creamy curries and not a big fan of spice, so this would be perfect for us! Sounds tasty!